A big thank you to Valentin for writing this sheet! 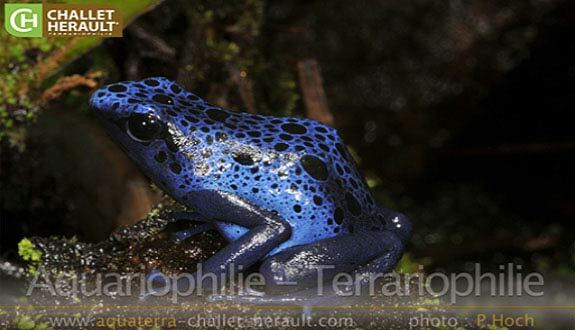 Easy to maintain and very beautiful, the Dendrobates azureus frogs are more and more popular. Indeed, they do not lack assets! 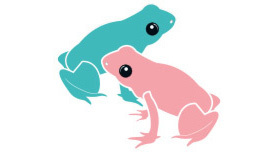 Find in this page all you need to know about these friendly little frogs. The male is slimmer and smaller than the female. Only the male sings, a real diva! 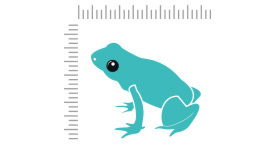 1 to 3 specimens: 45cm or 18"
4 and more: 60cm or 24"
How to feed the Blue poison dart frog? Insectivore, the diet consists of live prey including small insects such as Drosophila, crickets (size: micro), Collembola... Do not hesitate to supplement these insects in calcium. Food will have to be available every two days in the paludarium (in several places if possible to allow them to eat more easily). Watch out for overeating because Dendrobates tend to be obese. 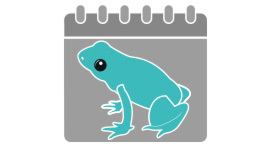 What kind of behavior does the Blue poison dart frog have? Active during the day (daytime). They may be shy at first, but after a period of adaptation they will feel more comfortable and come out of their hiding places more and more. 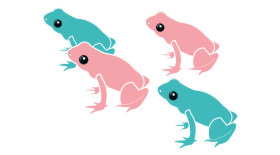 Who can live with the Blue poison dart frog? The Blue poison dart frog live in groups of a few individuals. 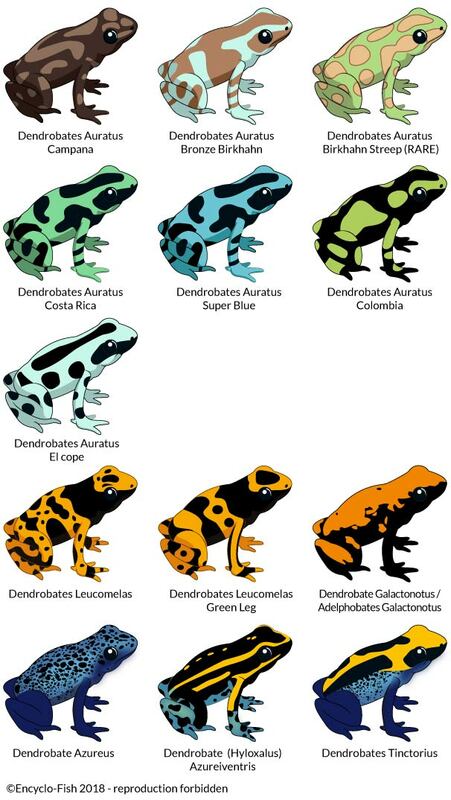 Beware of cohabitation with other species of Dendrobates because, even if it is possible, it is still quite delicate. Indeed, they are quite territorial frogs! As a precaution, prefer the addition of individuals of the same species. 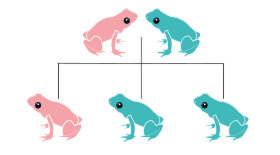 How to breed the Blue poison dart frog? Sexual maturity appears between 16 and 18 months. The love parade lasts 2 to 3 hours. The male calls the female with a long, peculiar cry, and the couple retreats to a hidden place. A few hours later, the female lays 2 to 10 eggs on a wet surface (like foam for example...). Each egg is contained in a gelatinous transparent pouch. Wait 48 hours before removing them. You can then place them in a small transparent box with a small bottom of a water specially prepared to avoid the mold of the eggs (mixture between mineral water, dried alder fruits and dried Catappa leaves: all this gives an acidic water). 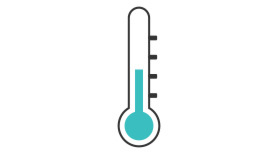 The temperature should be 23 to 25°C (73 to 77°F) inside the box. 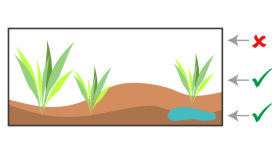 The tadpole will gradually form then it will pierce the envelope (note: leave its envelope because it serves as food, and it is very nutritious). Once released, each tadpole will have to be isolated in an individual box or small pot to avoid that some get killed. The young tadpoles will be able to eat fish flakes, spirulina... To promote their growth, it is important to feed them well and change the water regularly (always using the same mixture of water mentioned above). 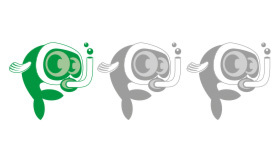 At the end of the development, the 4 members will grow out: lower the water level to allow the transition from «fish» to frog. Which paludarium for the Blue poison dart frog? Being semi-arboreal, the Blue poison dart frog will need some supports to climb: roots, barks of cork... Hiding places are also essential for their well-being (hollow coconut for example). 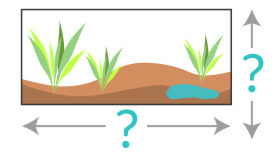 The substrate will consist of coconut fiber or peat and a light layer of moss or sphagnum. You can also add clay balls to the bottom of the paludarium especially if the paludarium is planted. A cup of water will be placed in the paludarium: the water will have to be changed almost every day. Opt for a shallow cup to prevent drowning. The paludarium should be constantly moist. For this you can install an automatic misting system. Another less expensive but more restrictive solution will be manual sprays twice a day. Note that your installation should be well ventilated to avoid bacteria and mold. Good lighting is essential especially if the paludarium is planted. Thus, a neon UVA or horticultural tube will allow a day/night cycle of 10 to 12 hours and good growth of plants. On the heating side, the spots are not appropriate because the paludarium will dry up too quickly. Instead, choose low power carpets or heating cables. 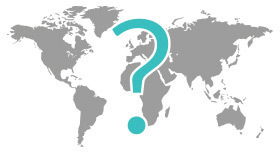 What are the colours and patterns of the Blue poison dart frog? Handling: Wash your hands thoroughly before and after each handling; They will have to remain exceptional and will be kept to a minimum. In the wild, the Blue poison dart frog have toxins due to their diet. However, in captivity, they lose these toxins and are therefore harmless.